More than 90 percent of people suffer from acne at some point, according to Children's Memorial Hospital. So the odds are high that you may be battling blemishes at some point. Several factors cause this skin condition that's characterized by oily skin, whiteheads, blackheads, cysts and scars. While eggs and other foods do not cause acne, they can make it worse for some people. The initial blame lies with your hormones, which trigger oil glands to produce excess amounts of an oily substance called sebum. When sebum, dead skin cells and bacteria clog up your pores, inflammation sets in and pimples develop. Due to the fact that acne has several causes, a multifaceted approach to treatment — including tweaking your diet — will yield the best results. The Western diet, which is typically high in meat and meat products — such as eggs — refined carbohydrates and processed foods, increases insulin and inflammation in your body. Inflammation drives up oil gland production, making your skin oilier and inviting to acne bacteria and pimples. 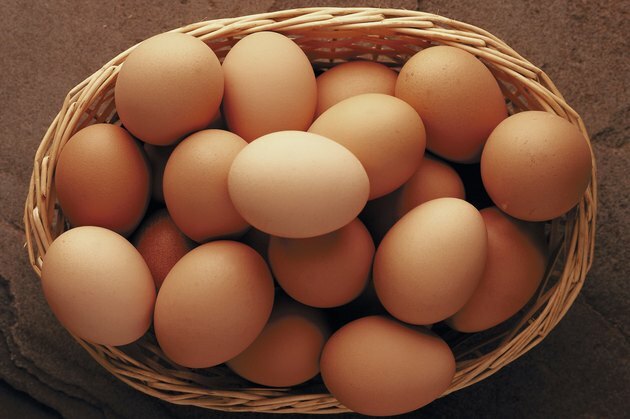 Furthermore, non-organic eggs come from poultry that are fed hormones, which disrupts hormonal activity in your body. These poultry also receive antibiotics, which interferes with the balance of bacteria in your intestines. Intestinal bacteria may play a role in acne, according to a study published in the journal "Gut Pathogens" in January 2011. If you believe that eggs are making your acne worse, try cutting them out of your diet for four to six months to see if it makes a difference. According to the American Osteopathic College of Dermatology, it can take this long to see improvements in acne after eliminating certain foods. However, keep in mind that many products are made with eggs, such as mayonnaise, pasta, bread and cakes. Cutting back on these foods may be your next option if eliminating eggs alone doesn't yield the results you want. If you are on a special diet, do not eliminate eggs or any other foods without speaking to your doctor first. Also, even if you change your dietary habits to treat acne, you should still be using other treatments. Topical remedies such as creams or lotions with ingredients such as benzoyl peroxide or salicylic acid help to reduce skin oiliness, kill skin bacteria and speed up skin-cell turnover. If these aren't effective, a dermatologist may recommend trying prescription topical remedies, such as those with retinoids, or oral medications such as isotretinoin.